In the endeavor to put some meat on the bones of the Chinese side of the Robert Park story (e.g., What was Park doing in Yanbian and what was the Chinese police response? ), a recent commenter on this site pointed my attention to the website of the Yanbian Public Security Bureau. Sure, its posts about cops sharing some grains with local households are just standard P.R., but in fact there are some wickedly interesting police reports there digested for public consumption. 延边州公安局 Yanbian Autonomous Region Public Security Bureau, Yanji City west side, near the airport, not far, in fact, from where I was almost abducted this summer by some guys claiming to be "xinjiang terrorists"
On this website, I asserted here that I had found information pertaining to a manhunt for someone who was likely to be the North Korean defector-turned South Korean citizen who was Robert Park’s contact in Yanji city. In the comments section of this post on Robert Park’s portrayal in the Chinese press, one suggested that this December police report from Yanji might provide a few clues about manhunts in Yanbian after the Robert Park walk across the Tumen River. Well, I translate it below, and, while it certainly doesn’t refute my earlier assertion, it does tell you why a bunch of cops were up all night on Christmas Eve in Yanji and why Public Security was a bit on edge when he went over the border. It also gives a nice sense of the sometimes-tenuous status of the drive to establish a through-going “rule of law” on the Chinese frontier, particularly in an area probably awash in various currencies (particularly RMB and USD) counterfeited by the North Koreans across the border. Yanbian Automomous Region Public Security Bureau, “Yanji Police Successfully Route Out the Case of the Great ‘December 16’ Theft [延吉警方成功侦破“12.16”特大抢夺案],” 28 December 2009, URL (full text in Chinese). At 10:15 on December 16, 2009, Yanji City Public Security Bureau received a report. It stated that in an office (room 1206) at the “New Century Mansion,” in the process of exchanging American dollars for Chinese yuan, a man robbed three victims of 140,000 yuan and then escaped. On December 25, the Yanji Public Security Bureau held a news conference, giving a report the previous seven days’ progress on the investigation. They stated that three suspects had been netted in Hegang city [鹤岗市] in Heilongjiang province, and that the three guilty suspects had been arrested and brought back to Yanji on the night of December 24. After the outbreak of this incident, Yanji City Public Security Bureau attached great importance to quick movement, immediately establishing Kim Kyung-il [Jin Jingri / 金京日] as commander, Jin Huzhe [金虎哲] as vice-commander, and setting up a brigade of “12.16” investigative command. Physical descriptions and drawings of the suspects were obtained through the testimony of the victim of the 12.16 crime, and spread through the media, including the notice of a reward. An expansive effort followed, including retrieval of surveillance videos [监控录像], and visits took place all over the city, thoroughly checking rental housing, hotels, and bath houses, and so on. On December 20, police had in their hands some very valuable clues. According to the impressions of two hotel owners on Jinxue [“Improved Study” 进学街Street], suspects had stayed in their hotels, but had gone to other hotels to do their business. According to these clues, the investigative headquarters determined the three biggest suspects of the “12.16” case, surnamed Yang, Zou, and Zhu. Through investigation, police made progress through gathering of further detailed information about suspect Yang, integrating analysis and information to find that Mr. Yang may have fled to Hegang City in Heilongjiang Province. As a result, police officers rushed to the headquarters and immediately organized a team of cadre to go to Hegang in Heilongjiang. On December 23, with the vigorous assistance of Hegang City Public Security Bureau, the three big suspected thieves, Mr. Zou, Mr. Zhu, and Mr. Yang were captured at the “Oriental Hotel” [东方宾馆], where investigators confiscated 63,901 U.S. dollars, 30,400 Chinese yuan, and 360 Hong Kong yuan. 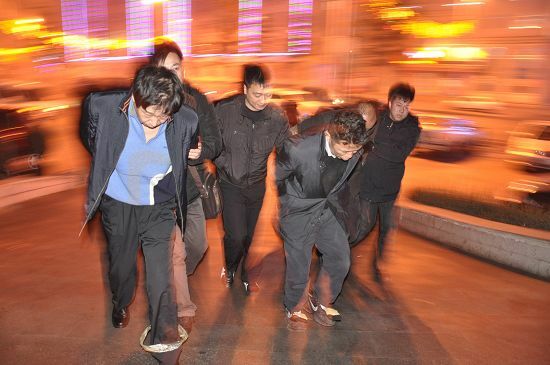 On the evening of December 24, the suspects were escorted back to Yanji. After the return to Yanji, the local Public Security Bureau spent the night doing an in-depth and detailed review: criminal suspect Mr. Zou was found to be of Han nationality, born in 1962, with a residence [户口所 hukou suo] in Nanchong City [南充市], Sichuan Province. In July 2000, Mr. Zou had been in Tibet, and, due to fraudulent resale of American dollars, had been sentenced to imprisonment for 12 years. He was released in May 2007. Criminal suspect Mr. Yang was found to be an ethnic Korean born in 1969 with a household registration in Hegang City, Heilongjiang Province. He was determined to be a temporary resident [暂住] of Yanji City. Suspect Mr. Zhu was found to be of Han nationality, born in 1964, with a household registration Hegang City, Heilongjiang Province. In July 1999, due to theft, he had been sentenced to imprisonment 12 years. He was released from prison in March 2006. Within this group, Mr. Yang and Mr. Zhu were from the same hometown [同乡], and had been in close contact since 2005. As for Mr. Zou and Mr. Zhu, they had been fellow inmates in the same prison in Lhasa, and, since the two of them had been released, often kept in touch. Early in December 2009, the three men consulted in Yanji City, determining how they would rob U.S. dollars from a person engaged in foreign exchange, and got money used to carry out the crime from Mr. Yang. After this premeditation [预谋后], Mr. Zou selected the targets. He thereafter did five separate exchanges of U.S. dollar transactions with the victims – the biggest amount being 50,000 U.S. dollars — to gain the trust of the victims and relax their vigilance [放松了警惕]. Then, based on the information provided by Mr. Yang, Mr. Zou went to “New Century Mansion” and rented room 1206 to use as an office. Together with Mr. Zhu, they renovated the room [装修], separating it out and adding security doors fitted to prepare for committing crimes. The morning of December 16, Mr. Zou tasked Mr. Zhu with tracking the victims, surveilling the corridor outside room 1206, and telling Mr. Yang to get good vehicle from his previous employer to wait at the back door of the “New Century Mansion.” Then, the three victims arrived inside room 1206 for the exchange. They gave Mr. Zou 140,000 U.S. dollars. Mr. Zou then went into the previously prepared room, locked the doors, and escaped. After perpetrating this act, the three suspects then took the three suspects got in the car and fled to Changchun, eventually going to Hegang City, Heilongjiang Province. According to the understanding of the investigation, in Hegang city, Mr. Zou lay claim to about 60,000 U.S. dollars of the spoils, and then divided the remaining 80,000 U.S. dollars equally, giving each person a share of 26,700 U.S. dollars. Mr. Zou’s possession of 60,000 U.S. dollars are being traced, and the case is under further investigation. The public security organs to remind the masses: unauthorized reselling of U.S. dollars and other valuable securities is against the law, exchange foreign currency to go through the normal channels of exchange of financial institutions; and, if there is a cash transaction, we must ensure safe and reliable behavior. To the greatest extent possible [尽量], use financial institutions to conduct banking transactions. As the year reaches a coda, the masses should strengthen their own precautions: Do not give criminals any opportunity to even sit down, and, if illegal violations occur, report them immediately to the police for assistance. Can you imagine, by the way, what similar police reports look like across the border in North Korea? If Good Friends reports make for bracing reading, one can only imagine what the cops are saying and seeing. You can bet that the reports near Hyeryong, where Park walked across the Tumen River, are probably digitized, but we’re maybe decades away from the notion of even the most limited public transparency for security organizations taking hold in the DPRK. (中国的开放社会加油！) I’ve had the unsettling pleasure of reading North Korean police reports from the 1945-1950 period, thanks to the fact that U.S. Marines plundered the DPRK’s archives from that period and stuck them in the vault in Maryland, now site of scholarly sojurns until we normalize relations and hand the records back according to international law. In the meantime, I’m for one glad that we can use Chinese websites to get a bit closer to what is happening on that vibrant side of the North Korean frontier. Preferred Citation: Adam Cathcart “Crimes and Misdemeanors in Yanji,” Sinologistical Violoncellist blog, 8 February 2010, URL. Yanbian Automomous Region Public Security Bureau, “Yanji Police Successfully Route Out the Case of the Great ‘December 16’ Theft [延吉警方成功侦破“12.16”特大抢夺案],” 28 December 2009, URL (full text in Chinese), translated by Adam Cathcart in “Crimes and Misdemeanors in Yanji,” Sinologistical Violoncellist blog, 8 February 2010, URL.